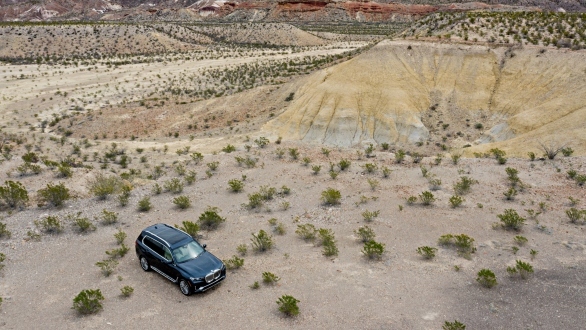 How many SUV's do we make to meet the growing demand? How big is big? If it is large, should it not seat seven, or maybe six, in great comfort and luxury? And if it is huge and heavy, how do we retain BMW's DNA of fun to drive and sporty performance? And as we will call it the X7, then must it not have all the luxury and style, that the 7 nomenclature stands for? 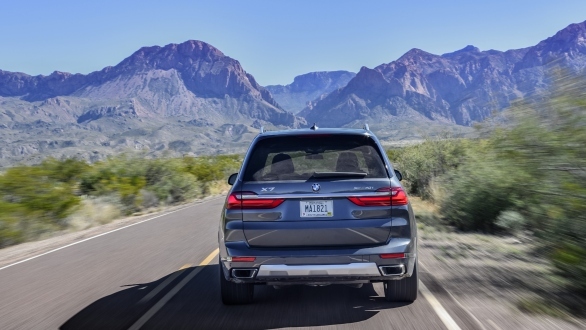 Well, with the new X7 that was launched in some international markets in March, and which we drove recently from Las Vegas to Los Angeles, via the Death Valley where little life flourishes, BMW have attempted to answer all the above questions and more. Now their SUV range of models spans from the X1 to the just introduced X7- so they have seven separate models in all sizes to suit all requirements. 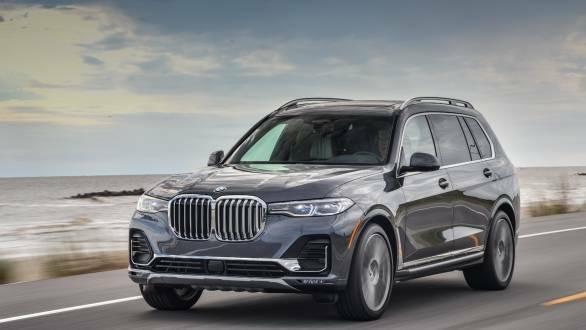 Like the X3, X4, X5 and X6, the X7 will be built at BMW's South Carolina (USA) plant and its main market is obviously the US, the land of large SUV's and everything size XXL. 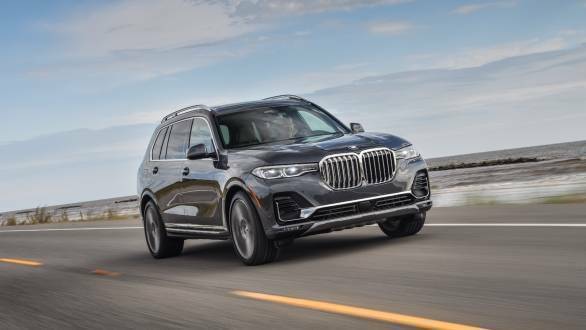 With the global SUV craze showing no signs of diminishing, it appears the new mantra for most auto manufacturers, including BMW now is "Build more SUV's, as the more you have, the more you sell". The new X7 is BMW's largest SUV and its heaviest production car yet (well over 2.3 tons for the lightest variant). At 5,151mm long, 2000 mm wide and 1,805 mm tall, the newest BMW SUV, is larger than a Range Rover! And also bigger than a Mercedes-Benz GLS Class or for that matter the Audi Q7  all SUV's that it locks horns with. The wheelbase is 3,105 mm and you could fit a small car between those wheels! The BMW X7 is so enormous, that is actually dwarfs its own sibling the X5, which itself is no midget. While it is based on a stretched version of the X5's platform and it can seat seven (or six) and they also share some styling cues that is where the similarity ends. The X7 has the largest kidney grille in BMW's history. It's so tall, wide, upright and covered with so much shiny chrome that it must now rank alongside the likes of Rolls-Royce, for most dominating car grilles! 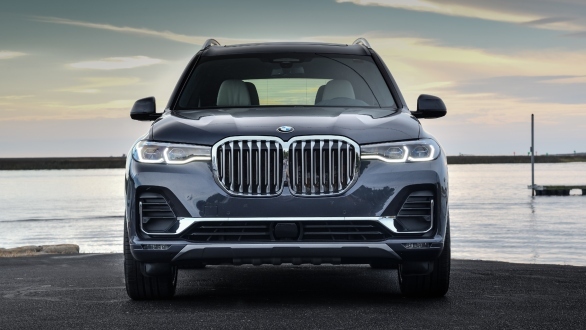 This grille is not just the centerpiece of the frontal styling, but the entire design of the BMW X7 appears to be influenced by it. In fact, it makes even the fairly substantial headlights, appear diminutive. And so large is the gap between the active air flaps or grille vents when they are open, that you can slip your whole hand inside! While, personally, it's a bit too much in the face for me, I think it will appeal to most customers of this machine. To the credit of BMW designers, when you look at the X7 in flesh, it does not appear that huge. This is because the length is complimented by a comparatively low overall height. The huge glasshouse area in between also helps reduce the mass of the X7 and gives the impression of it being elegantly elongated. The extensive greenhouse makes passengers (including those in the third row of seats) more comfortable as they not only get glass on their sides, but also over their heads in the form of an extended sunroof. This is as panoramic as it gets. But all that glass also means the A/C will need to work overtime, especially in our hot Indian summers, to keep the cabin cool. 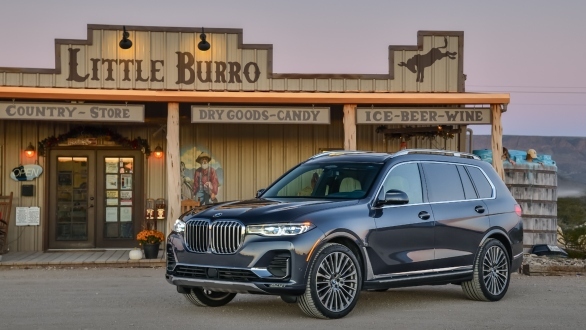 As the designers might well have intended, the BMW X7's proportions and design, ensure that it looms over almost everything else. It has formidable street presence and the X7 is unlikely to ever go unnoticed anywhere, especially in India. This is something that should appeal to some of our rich, particularly those that like others to know their status. 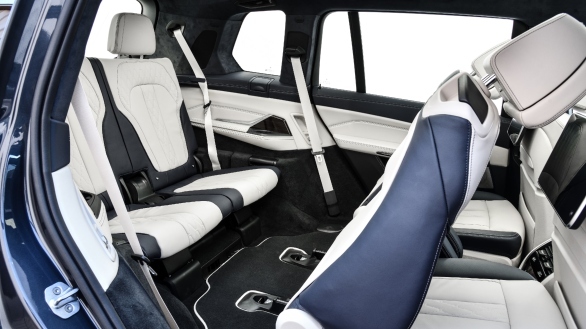 The most appealing and unique things about the BMW X7's interior are that the third row of seats are perfectly comfortable for two adults, and instead of a bench in the second row, you can also opt for two captain seats with individual armrests. While this reduces the seating capacity from seven to six, the two captain seats possibly offer the most comfortable rear seating available in any automobile presently. They are like luxurious lounge chairs, with power adjustments, plush cushioning and what not. As a matter of fact, all the seats, including the ones in front, are wide and sofa like and electrically adjustable. They provide exceptional comfort and support along with loads of space, as BMW designers have fully optimized the large external dimensions to create a tremendously cushy interior. Even after driving almost 700 kms in a day, one stepped out none the worse for wear. Another highlight is how silent the cabin is. Sound insulation is truly outstanding, and BMW engineers say they strived very hard to achieve this and used various innovative methods, including having two firewalls with sound absorbing materials sandwiched in between! Another appreciable thing is the visibility from the driver's seat. The fairly upright A-pillars, large windscreen and windows and low dash and high seating, ensure the driver has an almost bird-like view. As is to be expected, the BMW X7 comes fully loaded with a plethora of features including many related to safety. It has two 12.3 inch display screens with increased user interface functionalities, fully digital instrument cluster, and full range of driver assistance systems, gesture control and Apple CarPlay. Interestingly, the voice control system can be used by saying, "Hi BMW". The BMW X7 comes with a crystal glass gear selector and the complete interior is finished in a selection of the finest leathers, woods and metals with the fit and finish being top class too. With all three rows of seats up, the boot space is about 326 litres, similiar to that of a small hatch. But electrically fold down the last row and there is more than enough space for your stuff, with even more (2,120 litres) available if the second row is also folded. 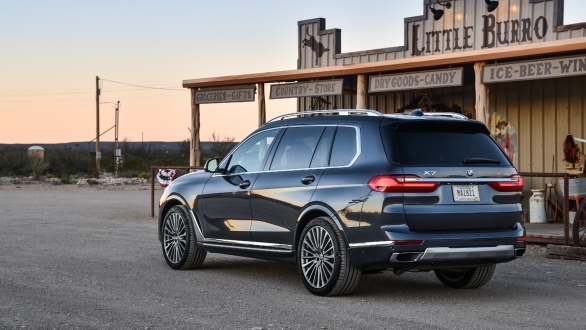 In case you want to lower the loading height, all it needs is a push of a button for the standard air suspension to drop the BMW X7 down by 40 mm. The BMW X7 comes with various turbo-charged engines, but the one that should interest us in India the most, is the 30d variant. It has a 2993 cc, 6-cylinder diesel engine that makes 265 PS and 620 Nm of torque, and gets from 0 to 100 in 7 seconds. The fuel efficiency as per the European Rules is about 15 kmpl. The more powerful diesel, the M50d should also come to India and it generates 400 PS and 760 Nm, taking 5.4 seconds to get to 100. Its fuel efficiency is said to be 13.5 kmpl. Other engine options include a 6 cylinder and V8 petrol, and all variants come mated to an 8-speed automatic transmission with all-wheel-drive being standard. While the X7 is a heavy vehicle, the engines with their wealth of torque do a good job of moving it along and ensure there is no laziness while overtaking. It does not feel underpowered in anyway and even when the engines are working hard, you never get the impression that they are under any strain. The petrol V8 sounds great of course, and you often want to push it hard, just to hear the sonorous exhaust note. The gearbox is perfectly matched and shifts up or down quickly to draw the best out of the engines. 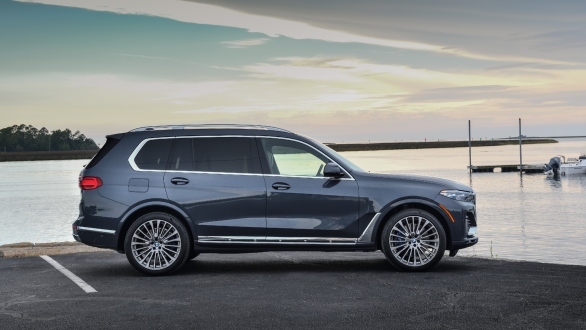 Get behind the wheel and what soon surprises you is the overall agility of the BMW X7. The laws of physics would have you believe that nothing this big and heavy has any business to be able to change direction as quickly, or assuredly. But the engineers at BMW seem to have dug deep and pulled out everything from their mechanical and electronics bin, to make the X7 a remarkably athletic SUV. While on the move it actually appears to shrink around you and feels far smaller than it is. The body movement is tremendously well controlled and even in sharp corners or on highly undulating roads with sudden and fast changes of elevations, the body remains almost flat with minimum horizontal or lateral movement. The steering is precise and fairly quick to respond for a vehicle this size. The feel and feedback is also pleasing and makes for a more involving and enjoyable driving experience. Again something that is unexpected in this size and kind of vehicle. 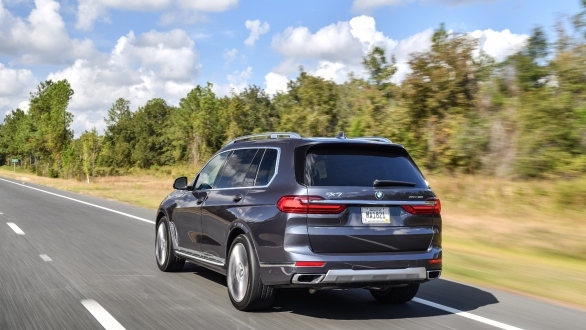 The BMW X7 has air springs on all four corners and adaptive suspension with electronically controlled dampers. The twin-wishbone front, and five-multi-link rear setup, does very well in keeping the large and fat tyres pasted to the ground and also providing the necessary cushioning to make the ride comfortable. This huge SUV comes with big 20-inch light alloy wheels as standard, and both 21 and 22 inch ones, are available as options. 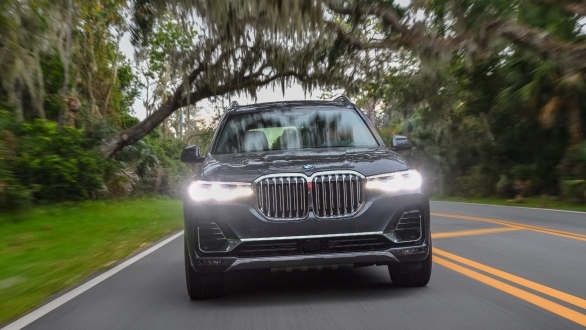 The X7 also offers a variety of driving modes that change the driving character by altering the ride height, engine response, gear shift points, steering feel and effort, etc. In Sport mode, the all-wheel-drive system becomes more rear biased too. The option list includes several other performance upgrades like an electronically controlled rear differential, rear-wheel steering, upgraded brakes, etc. Interestingly, the BMW X7 can be ordered with an ahead looking camera system that is meant to function like the 'eyes of the suspension'. These cameras are placed high in the windscreen and attempt to spot imperfections in the road, including potholes! They then relay this information to the suspension, so it can prepare and adjust itself to deal with the approaching road imperfections! Observing how this system works on our Indian roads should surely be most entertaining! BMW also offers an optional off-road package with additional skid plates and underbody protection and off-road driving modes like snow, sand, gravel and rock. The X7 also has functions like hill-hold and hill descent, and when any of the off-road modes is selected, the display screen shows the elevation and tilt angles, etc. The air springs which help reduce ride height, can also increase it (by up to 40 mm) when required, endowing the X7 with additional off-road ability. BMW's biggest SUV the X7, is actually quite a pleasant surprise. It has tons of space, incredible road presence, loads of features and luxury, and it's so agile and nice to drive, that it literally 'walks on air When it is launched in India in a few months' time, we expect the prices to be upwards of Rs1.25 crores. Should you buy it? If you can live with that grille and all the attention, yes. But make sure you have a large enough parking place, and it would really be quite a waste, if you didn't drive it, at least occasionally.